In our last post we looked at the Ann St Presbyterian Church in Brisbane's CBD. It was split off from Brisbane's first Presbyterian church that had been established by Thomas Mowbray at South Brisbane. 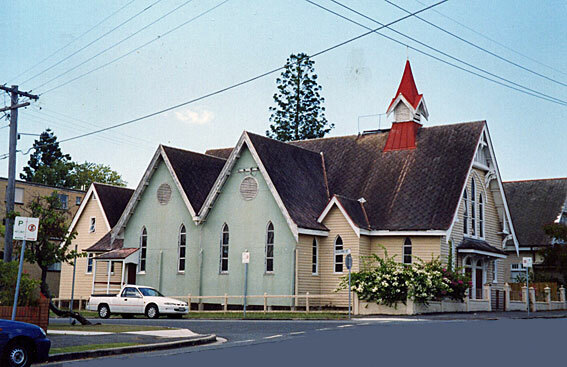 Today we have another connection to Mowbray - we are looking at the Mowbraytown Presbyterian Church at East Brisbane, built on land donated to the church by Mowbray's widow Williamina. Here is a photograph of the original church structure. 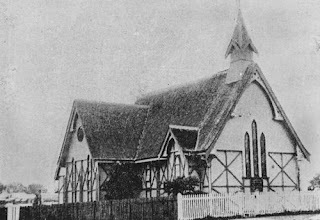 The church stands on land in East Brisbane that was originally owned by Rev Mowbray who died in 1867. In 1884, Mrs Mowbray sold a large portion of it, including the section on which the church is situated, for development. She must have had second thoughts, because in 1885 she bought back the two allotments on which the church was built and donated them to the Presbyterian church for that purpose. The church was designed by Alex B Wilson, a Presbyterian, and later an elder of this church. The church was completed in November 1885 by builder Thomas Gillies at a cost of £600. In 1909, the church was extended and the main doors were moved to the front of the building. The church was decommissioned in 1997 and it reopened as the Mowbraytown Photographic Gallery. Here is a picture of the church from 2004. According to the people at Preserving Mowbraytown, the building is no longer open to the public. I wonder what it is used for now? In any case, it is protected by the state's heritage legislation. Here is a current photograph. The original church, designed by the architect you named (Alex B Wilson), is appealing but very unusual. I wonder what sort of look he was going for. I believe that some of the features, like the double entry doors and the lancet windows, are typically found in Presbyterian churches. But AB Wilson was one of Brisbane's well-known architects of the late nineteenth century. It is currently the offices of BCA Consultants, Building Services Consulting Engineers. The renovations are by Base Architecture, a local firm based at the Grange.